Allright now I get it I'm kind of used to this system so that's why your approach was kind of confusing. but I want to to have some flexibilty in the future on what or where the 1.1.1. actually is. Or like have the possibility to change what the master loop is etc but I think with this modular approach that should be possible. I have my looper hardware now finished, (4 switches stompbox format with leds for looper state etc). P.S. I just fixed the chained recording When I have everything done I will share my patch here. and pictures of the hardware! I started working further on the chained recording concept and started to integrate a multimode button interface I built earlier. I'm facing some problems with clicks doing chained recording and I thought you might have an idea how to get rid of them. My first Idea was of course envelopes. So I patched and ahd envelope using the rec out as trigger. The first loop is always perfectly clickless but the second on I do using the slot switching has really harsh clicks. Problem with the envelope is that the moment when recording stops after the first loop is to short to let the envelope go back to zero. Any Ideas on that? I tried to clean up the patch as much as possible. I could get rid of the clicks with slot switching. It seemed to have to do something with the transistion from going to record into overdub. So I smoothed out the input of the overdub module in order to solve it. 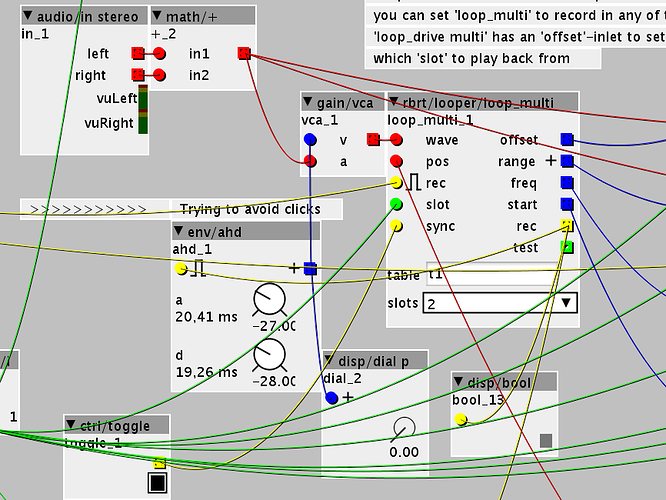 when using either you looper_dub or the looper_slave module for overdubbing clicks are introduced into the loop. I think this is not a problem related to overloading the table. It also occurs if you only record one layer and then let overdub on. Already after 2-3 repeats the clicks a clearly audible. These clicks are not neccessarily at the loope boundaries but all over the loope. Since no more material than the first loop was added I think its not related to overloading the table. I also deliberately overloaded a table, this sounds completely different than the clicks I'm hearing. the rec/dub input of looper_dub and looper_slave behave some what unreliable. When turning on and off there is a big irregular latency (I watched it with the b output of Looper_slave, or listened when using dub) I also had situations where looperslave wouldn't react to changes of at the rec in at all. Considering that leaving Overdub on will destroy your loops this is really annoying. The clicks I had in the post above seemed to be introduced by switching from recording into overdubbing. I'm asking myself if you really need two modules for this. Couldn't overdubbing be integrated into the loop_multi module? I mean usualy it is always either overdubbing or recording and on only one of the slots. (a known issue).could you send it to ´me with embedded subpatchers? so I can't really tell what is introducing the clicks/latencies. here is a newer version with embedded subpatches and 4 loop slots. It is a bit big since I want to wait with organising it into subpatches untill everything works, since all the parts are interconnected. I did a test with the odub help patch, I did have no clicks. But in my patch it clicks a lot. This is a test patch for loop_slave. The rec status almost instantly freezes. P.S. I tried with an internal test signal too, so the clicks dont come from external input. are your trigger inputs properly debounced? just a shot in the dark really. P.S. just tested the _dub object bit more, works reliably no clicks or latencies. BUT I can't use this one because it lacks overdub feedback. So my way to go is loop_slave wich causes me some trouble. Maybe because it's not intended to be used this way. ah ok. I tested with only internal components and still have the same problems. something like 'play pitch loop' to mangle audio in tables. check out the objects help file. Hey, I'm loving your loopstation! If I could make one request, I would ask that you could make it possible to sync to a clock. It would be nice to be able have the record start and stop points, as well as the loop phasor reset always line up with the clock, so that it could sync with external devices - midi daw, other sequencers, etc. I've been trying to see if I could tweek your patch to make it work, but so far haven't been successful. I'm quite busy right now,but I'll try to figure it out soon.. I think it's going to work,but I see some problems regarding jitter of the external clock...this is likely to introduce clicks in the loops.. Thank you! No rush, just maybe on your next pass. As far as jittering, maybe you could put in a ... (I forget what its called!) A thing that won't let it update if it has already updated in the last n milliseconds or something. If you want to try something yourself the first thing would be to interfere with the quantization phasor in Rbrts patch. If you sync that one to clock the lenght of your recordings will relate to midi clock. You could maybe replace it with a counter, since only the moment when the phasor is at 0 is important, right @rbrt? But still if your clock drifts or you change the tempo, the timing will get fucked up. The next step could be to multiply the frequency inlet of the playback phasors with the ratio of the current tempo in relation to the tempo during recording of the loop. That way your loops will pitch down (and slow down) or up when you change the tempo. That ratio part is not so easy in axoloti, since you have to divide the current tempo through tempo during recording and dividing float values in axoloti is not that easy. Last part could be a mechanism that retriggers the loops. You could have them either automatically retriggering after each cycle, or make it optional like on the Kaosspad. I think the kaosspad only quantizes recording length, at a certain moment loops start to drift. Then you can press resync to put them back in phase. I made several efforts in all of these directions, unfortunately it is somewhat spread among several patches, but I can try to get it together for you. Thanks, that gives me some more ideas to work with. I'm really digging rbrt's loop toolkit! The ultimate looper is within reach! ...sets or inits the indexes of a table to the values defined by the sliders/dials on rising edge of 'trig'. performance-wise they are about the same as the 'old' objects. and 'lmangle' can do palindromic (switching from ffwd to rev at loopends) playback as of now. there's a '1-shot' - object playing back an area of a table once and then stopping. aaah and 'ldub' now has a 'feedback' - parameter!! I will keep them.thus,the new folder 'loopv2'. here are some modules for building step-seq's. besides,there are some other custom objects that I feel make sense for step-sequencing. -step toggle : will toggle an element at an index (or step).if the step == 0,it will be set to a defined value,if its non-zero,it will be set to 0. -read step : reads at an index and outputs the value. outlet 'trig' puts out a pulse if the value is non-zero,outlet 'vhold' will hold the current value until the next pulse.